I can't believe it's already Sunday night. I feel like it was just a few minutes ago that I woke up on Saturday morning, ready and raring to go for the weekend. *Sigh* Times flies and all that jazz... I didn't spend much time in the Craft Cave this weekend but I managed to complete a card for this week's Tuesday Trigger at the Moxie Fab World. 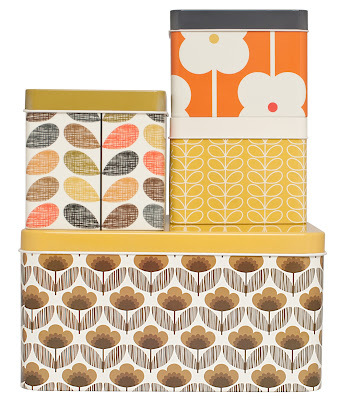 I love these fun patterned tins and, although I had lots of ideas running through my head, I was especially inspired by the top right one. Love the white popping off that orange! I'm also going to enter this card in the Lily Pad Flowers challenge and the Simon Says Stamp Anything Goes challenge. It may be a bit quiet around here for the next week. I've got a few extra work shifts and Luis and I are also planning on doing some more painting. Hopefully this will include the Craft Cave although the thought of moving everything out of the room is a terrifying one!! Jen, this is truly, truly fabulous...love all the gorgeous white...and it has dimension! Love your take on the trigger! Happy painting...what colors are you painting? Gorgeous, Jen! Love how the white flowers "POP" against the orange background. So modern and cool! I feel like it still should be Saturday too....sigh. Ok, OMG - this is awesome! A winner for sure!!! Absolutely perfect. Wow I love this Jen, such a perfect replica of the pattern and just as eye-catching :0) I just never got round to this trigger which is a shame coz I love Orla Kielly patterns! Know what you mean about the wkds flying, at least the kids are off now although that will curtail craft time for me! Oh, I would hate to move all my stuff again...had to do it for carpeting 5 or 6 years ago, and yeah. No. Just no! Add that to working extra? Are you nuts? I love how your card turned out - the different-coloured centre pieces make the flowers just pop! With any luck your package should arrive this week - I hope. I cannot WAIT for you to get it!!! Love, love, love this Jen, it's totally FABfabulous!!! Wow! This is fantastic! Jen, you are amazing, AMAZING! Love it! 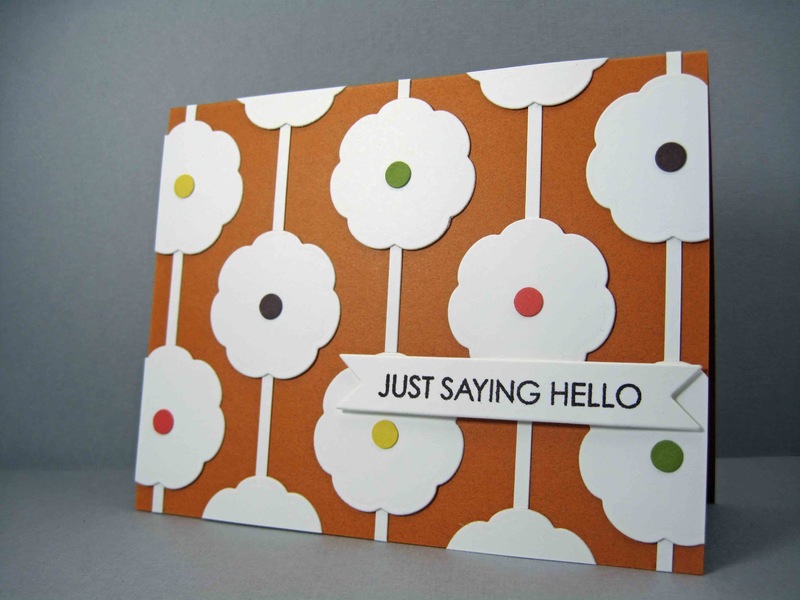 I love the way you took that pattern and recreated it for your card Jen. 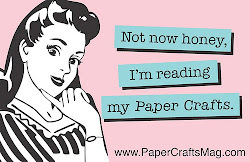 Moving all your craft stuff sounds like a very serious operation! Extra work shifts? Moving stuff out and back into the craft cave? That's not fun! This is a gorgeous card! Love the multicoloured centres on the white flowers. Love this, Jen - kind of reminds me of the 1960's when we all into "flower power" and lots of fun graphic images. Really pops! Good luck with your extra hours and paint project - a real pain, but the results are so worth it. congrats on being Tuesday Target. Just wonderful! Congrats on being a TT! Fabulous! Great minds think alike - I made a card very similar to this a couple years ago :) Congrats on being Moxie Fab! Totally, completely fabulous, Jen! I love, love, the graphic look of the card. Congrats on the MFW shout out! Hooray! Moving everything out of the craft cave? Yikes!! What a perfect card for this challenge! I love the different colored flower centers! Congrats on being a Trigger Target!!! Happy to be sharing the podium with you today! Congrats! Great looking card. Congrats on yur win! Congrats on your win! This is fabulous! Gorgeous, Jen! Congrats on being one of the Trigger Targets for this challenge! This is flat out cool! I love how this turned out and it is spot on my dear! I need to get back on checking out the triggers...it's been awhile. Those are die cuts - how cool. Great interpretation of the feel of the trigger. Holy Hannah! Love your take on the trigger... a total winner for sure. Congrats. You made my day by having created a super FABulous TT-inspired card!KUDOS!!! A super belated congrats Jen! This one was a winner from the get go, for sure! Love everything about it! And in those retro-modern colors, wow! Hope you and Luis are having fun (okay, maybe fun's not the right word, lol)! Painting is such a chore, but you feel so good when it's done:) Have a good one dearie!